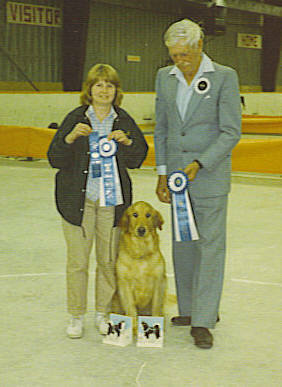 My first Golden Retriever "Laddie" with T.C. our neighbor's dog, pictured on the beach below our house. Laddie introduced me to the world of Dog Sports! He was my first golden retriever and quite the character. I adored him but he was a very naughty boy and I had a LOT to learn about training this very 'alpha' puppy that I had impulsively chosen. When he was about ten months of age it was off to obedience school for both of us! 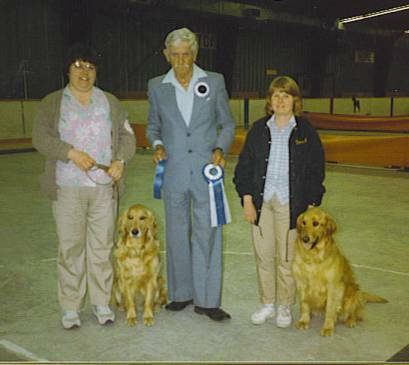 My very first obedience instructor turned out to be our good friend and obedience mentor, Linda Townsend. Laddie was not an easy dog to train but Linda was very encouraging and talked me into taking a second session. Actually, I think we flunked the first session and had to repeat it! That memorable first set of classes proved quite spendy........ while trying to teach the down, I ended up with a broken cap off my front tooth and a black eye! Monday nights became a ritual for us. 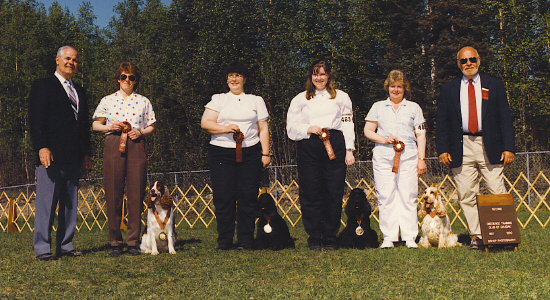 We continued with classes, I joined the Kenai Kennel Club and have been a member ever since 1984. If it hadn't been for that bundle of golden energy, I would never have made the lifelong friends that have become like my second family. 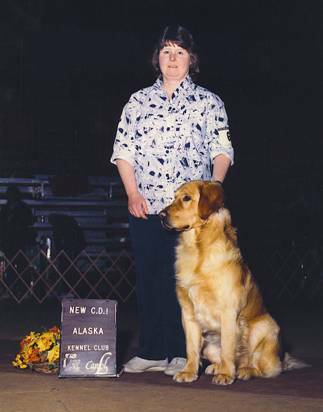 I went on to compete at the CD (Companion Dog) level in the U.S. and Canada with Laddie, my next golden Kyle, and my English Cocker Toby. Laddie and me on our first weekend of obedience trials. Here we are proudly displaying our trophies and ribbons! Laddie obtained his CD in 3 consecutive trials. Linda and I traveled to Whitehorse with our goldens Chamois (Chammie) and Laddie. 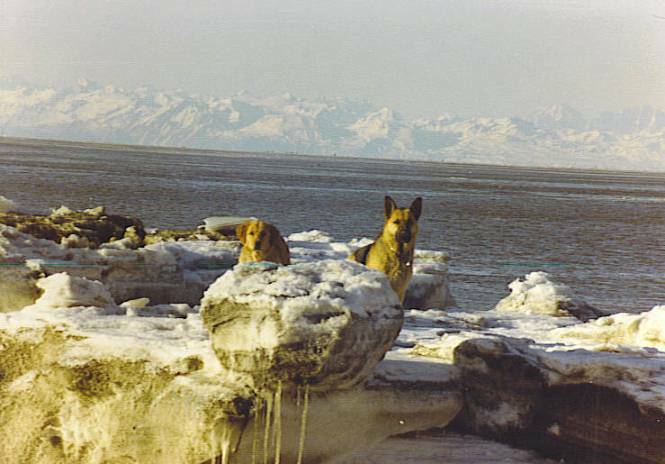 It was a trip of a lifetime with our obedience dogs. We couldn't believe all the lovely big rosettes. They were gorgeous! I can't remember much more except Linda and Chammie did extremely well. There were 6 trials over 3 days. We both got our Canadian CD's in 3 consecutive trials and Linda and Chammie were awarded THREE High in Trials and Grand Aggregate! Linda and I even had a run off for first place (the only time I ever beat her!) and Laddie and I got a High in Trial also! Several years later Linda and I traveled to Whitehorse again. We took 5 dogs and all our gear in my Toyota van this time! Here's a picture of all five of them at a rest stop on our way down. Aimee (10 months and very out of coat) was my first conformation dog. 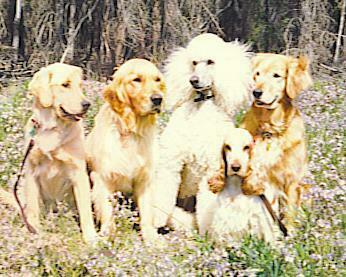 We took my other golden Kyle and Linda's golden Chammie and her standard poodle Sadie for obedience. My English Cocker Toby was in both conformation and obedience. It was a very busy time! Kyle and Toby both obtained their Canadian CD titles in three consecutive trials that year. He had scores in the high 180's and a First Place with 193. Kyle was a gift from my parents from England. He didn't turn out to be show quality but he had a wonderful personality and temperament. He was quite sensitive and very in tune to my body language when we were competing. If I was to twitch my head very slightly after the recall, he would do the finish! 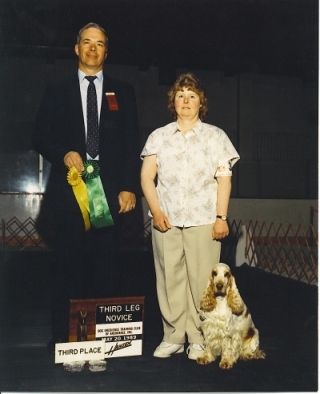 He was a super working obedience dog but my nerves in the ring held us back for higher scores. 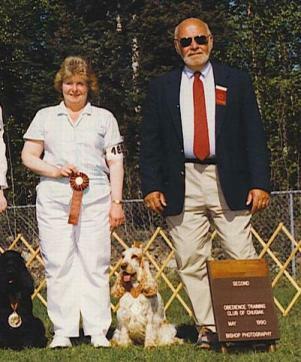 Toby was my third dog to complete his American-Canadian Companion Dog titles in three consecutive trials. He was a nice working little dog and all his scores for his American CD were in the 190's. Toby really was quite amusing on the sits and downs. I was always afraid he'd fall asleep and move when I returned to him. Even on the long sits (which are only a minute long), he would sit there and start to nod off! 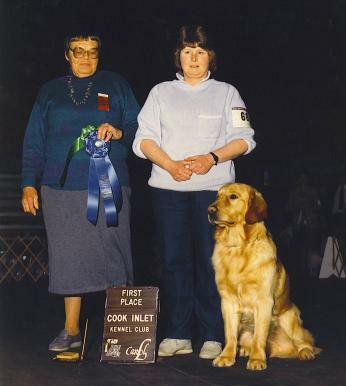 Toby also had 14 conformation points (with 3 majors) toward his American Champion title. As a child, my family always had orange roan English Cocker Spaniels and although I loved my goldens, I really missed them. At one of the dog shows in Anchorage, our good friend Leslie Batchelder told me she knew someone there that had a litter of EC's and she had orange roans! Most cocker litters are blue roans so I couldn't resist asking if I could go over for a visit. They were ready to go to their homes and there was no way I could leave without one! I called my husband Brian and said it was 'meant to be'. Toby lived a little over 17 years! His nickname was Toblaroan (after the candy bar Toblarone). 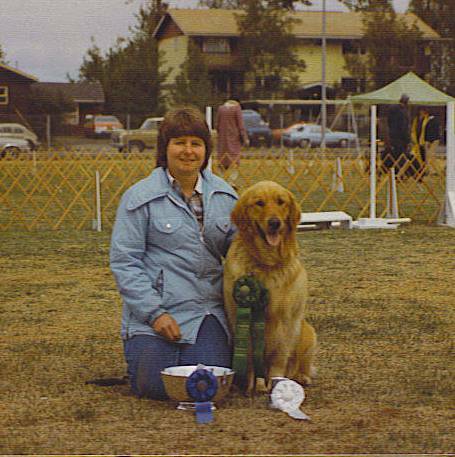 Cathy Pearce thought it would be fun for us to get a 'spaniel' obedience team together and compete at the Obedience Training Club of Chugiak's upcoming trials. I agreed to give it a try. I think we were all quite surprised when we took second place out of 4 teams! I lived 175 miles away from the others so the only practice we had together was the Friday night before the trials! Nowadays obedience teams usually come up with a theme or some kind of uniform clothing! I had to chuckle when I looked back at this picture. We all had pants on the color of our dogs - no doubt trying to minimize any crooked sits? !